How tall would A-Rod's annual salary be in pennies? You might never have asked yourself any of these questions, but Craig Robinson's Flip Flop Fly Ball will make you glad to know the answers. 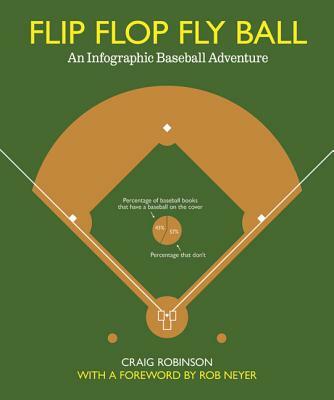 Out of Robinson's Web site, www.flipflopflyball.com, grew this book, full of all-new, never-before-seen graphics. Flip Flop Fly Ball dives into the game's history, its rivalries and absurdities, its cities and ballparks, and brings them to life through 120 full-color graphics. Statistics-the sport's lingua franca-have never been more fun. Craig Robinson is, among other things, an Englishman and a New York Yankees fan with a soft spot for the Colorado Rockies and a man-crush on Ichiro. Last season he played outfield for the Prenzlauer Berg Piranhas in the Berlin Mixed Softball League (AVG .452 SLG .548 OBP .575). His previous book, Atlas, Schmatlas: A Superior Atlas of the World, was deemed "highly inappropriate" by the director of the Forsyth County Public Library. His Web site is www.flipflopflyball.com.